You may have known the grandeur of the panorama of Ijen Crater. 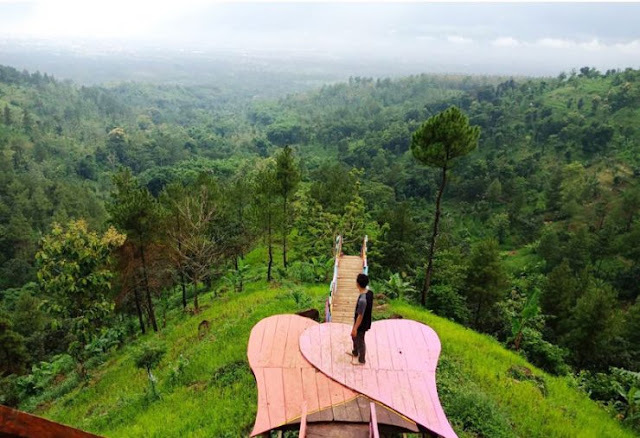 Then, do you know about Stonehenge van Java, Teletubbies Hill, or twin waterfalls? 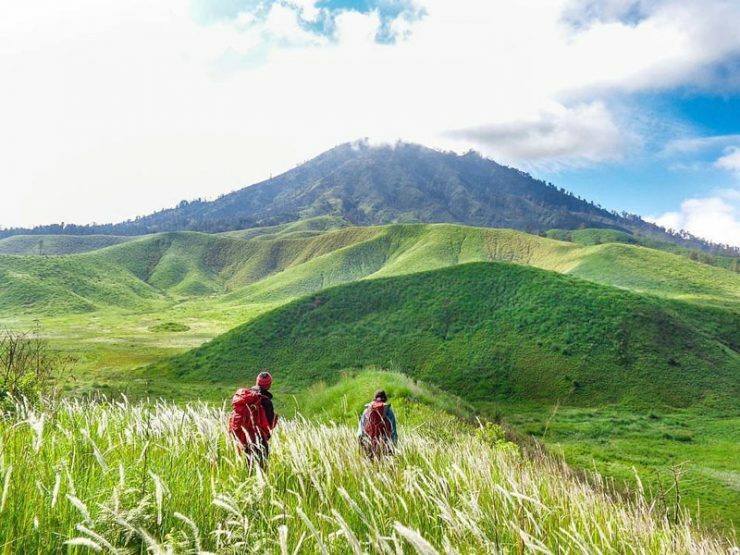 That is another natural paradise located in Bondowoso, an area on the east coast of Java Island that is far from the frenzied tourists, but secretly saves the charm of nature that has no death! 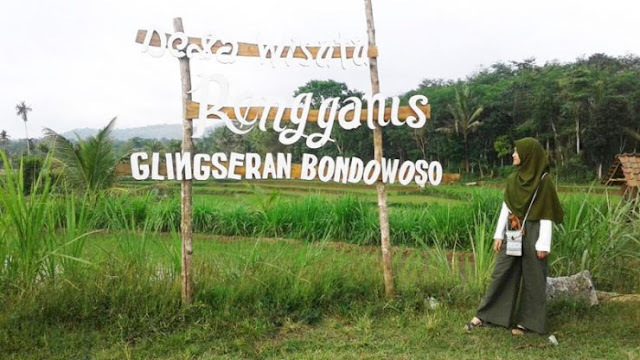 In fact, many of these natural charms have not been accurately recorded in Google Maps, so another "GPS" may be needed, namely "Use the Neighborhood Residents" Let's go along with Bondowoso's enchanting charms. Don't let anyone else know first! By air: Bondowoso does not have its own airport. 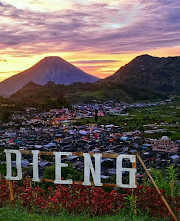 The nearest airport with direct flight connections to Jakarta is Blimbingsari Airport in Banyuwangi (3 hours from Bondowoso) and Juanda Airport in Surabaya (5 hours from Bondowoso). Airlines that serve flights from Jakarta to Banyuwangi are Garuda Indonesia, and NAM Air. From Surabaya, Garuda Indonesia, and Wings Air it serves direct flights to Jember, about 1 hour drive from Bondowoso. By land: From Surabaya, the travel time takes around 5 hours via the northern coast line. If traveling by train, you can go through Jember Station and continue the trip to Bondowoso for about 1 hour. 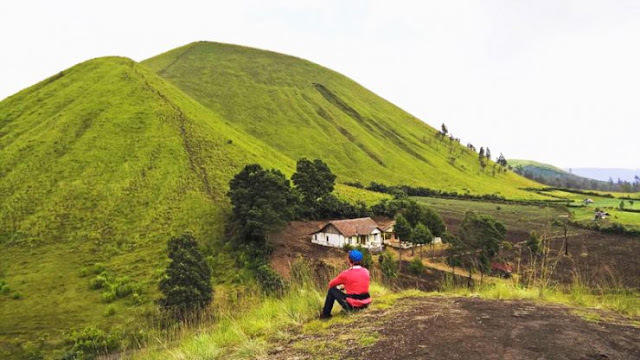 Wurung crater is a hill with overdraft like a mountain crater covered with grassland like a green rug. 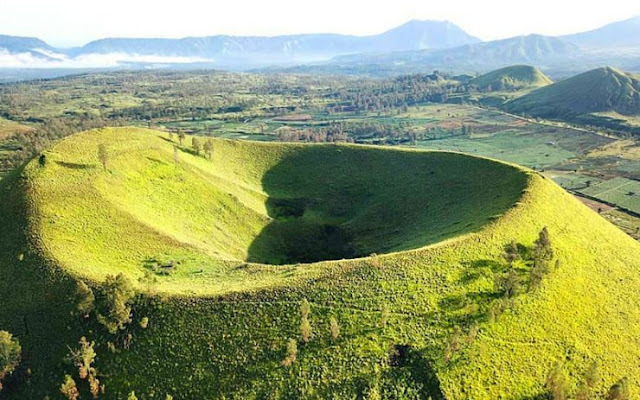 This crater is also known as the Bukit Cincin. Because it is located at an altitude of 1,500 meters, the air is also very refreshing. From its peak, as far as the eye could see, there was a carpet that lay wide. When the weather is sunny, Mount Ijen and Merapi stand side by side greeting you. You are guaranteed to never feel satisfied enjoying a scene like this. Oh yeah, if you look at the foot of the mountain, do you feel de javu? True, the view of the small green hill really resembles the headquarters of the Teletubbies. Indeed there are no Teletubbies here. But you don't need to be disappointed because you can find deer and cattle. After all, who doesn't want to take a photo on a green grass rug like this? In the midst of the lush forest of Bondowoso, it turns out there are unique magnificent buildings, which resemble the ancient site of Stonehenge in England. 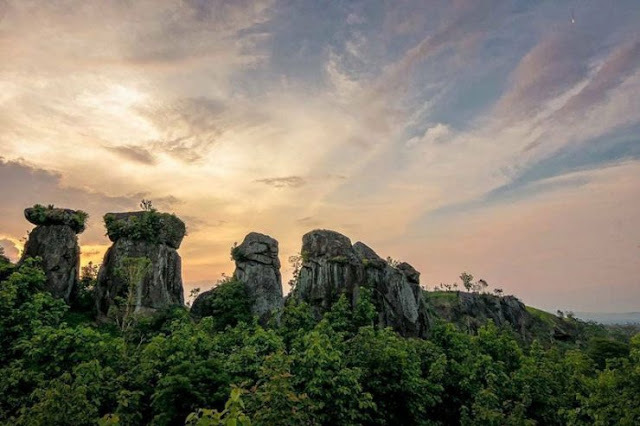 Seven giant stone stacks stood up in a circle. This is the "super KW" from Stonehenge. The existence of wild trees and bushes and their location at the bottom of the valley makes it even more beautiful than the original! Unfortunately, because it's in the valley, to look closely you need to go down a dangerous ravine. But you can enjoy the beauty of Betoh So'on from the top of the hill. And it looks even more beautiful because you can see and take pictures with all these rock formations. How can the giant rock stack together neatly? Just like the Stongehenge case, no one knows the answer. 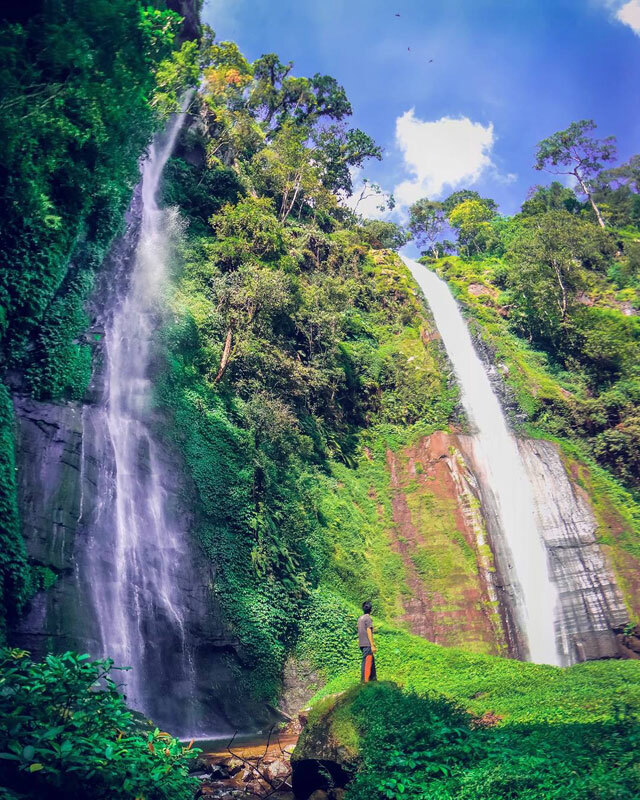 A waterfall about 30 meters high is worthy of being your first choice because it has a lot of uniqueness. First, the water is yellowish and emits a puff of smoke. This is because of the high levels of sulfur from Mount Ijen in it. Secondly, near this waterfall you can relax in hot springs which are believed to be effective in improving blood circulation and healing skin diseases. Third, the beauty of this waterfall can be enjoyed from the side of the cliff. This waterfall itself empties directly into the ground like Niagara Falls in America. About 1 km from here is another waterfall, Niagara Mini. The term is certainly not without reason. Although "mini" and only 6 meters high, the beauty can be pitted. Just one waterfall is cool, especially if there are two? This twin waterfall is hidden on the slopes of Mount Argopuro which is cool and surrounded by virgin nature. Flowing from a height of 70 meters through a hill gap and 20 meters away from each other, these "twins" always flow together both in the dry and rainy seasons. 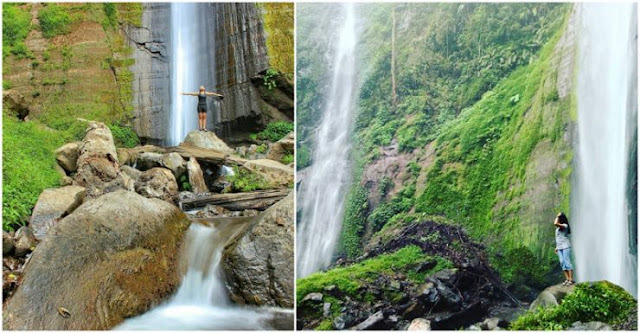 When heading to this waterfall, you can also enjoy the charm of a stepped waterfall that is about 50 meters high. What is unique about this waterfall is its estuary which is full of lumps of foam, as well as used water containing detergent. But this foam doesn't come from laundry soap. 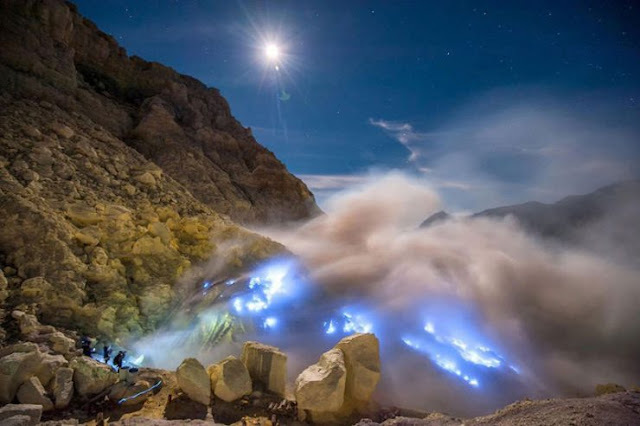 The source of water that comes from Mount Ijen and mixed with sulfur makes its mouth full of white clumps like foam. 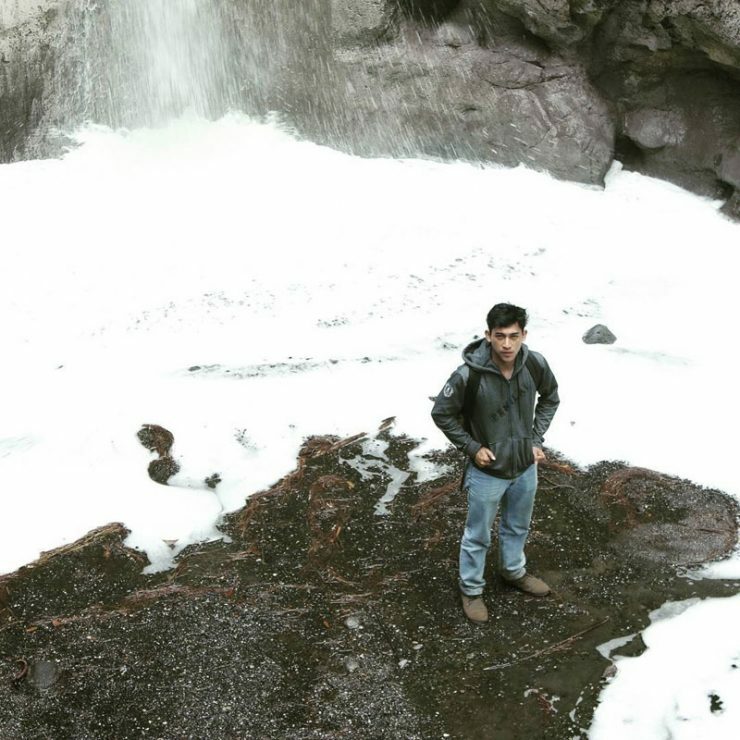 This sulfur waterfall is set against a rocky cliff that is also no less beautiful. Unfortunately you are recommended not to bathe here because the sulfur content is very high. However, nothing prevents you from taking pictures on the background of exotic cliffs. 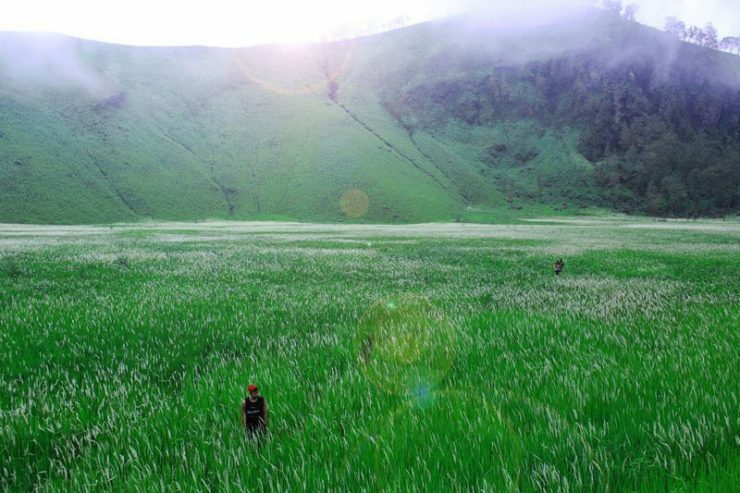 Ilalang Crater is a giant "stage" to enjoy the beautiful dance of weeds in the wind. 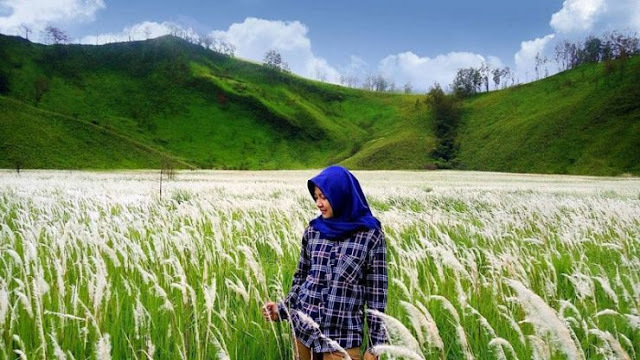 The background of the green hills and the panoramic view of Mount Ijen and Mount Raung, which make the show of this reed dance more attractive. Uniquely, when the weeds are blown by the wind, you will hear a sound like a lion roaring. Take it easy, it's just a breeze. There are no wild animals here at all. And of course the most special thing is, you can enter the "stage", take pictures, even dance together. If you drive from the direction of Probolinggo to Bondowoso via Highway Wringin, then you will go through the mini "Peak Pass". 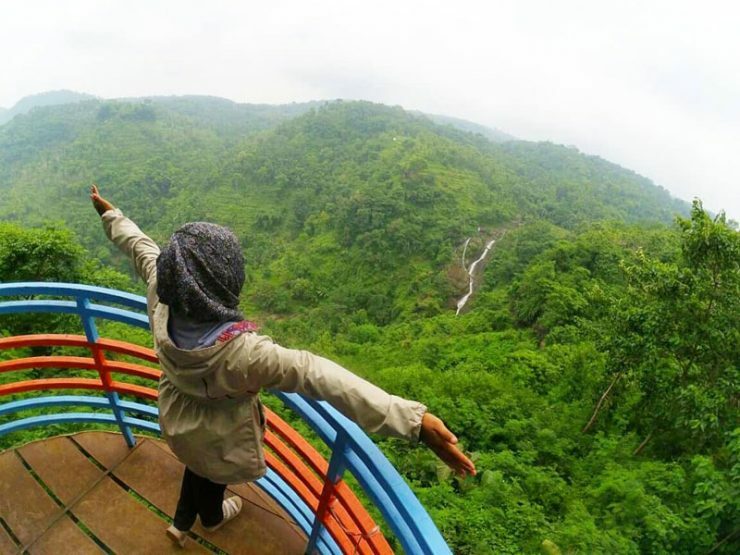 From the bridge provided, your eyes will be spoiled by the green of Bondowoso with waterfalls poking behind the greenery of the trees. There are also several tree houses and towers that are also suitable for selfie backgrounds. For those who like adventure, you can try visiting the caves of wine that at a glance look like the scenes in the film Jurassic Park. Curious ‘right? 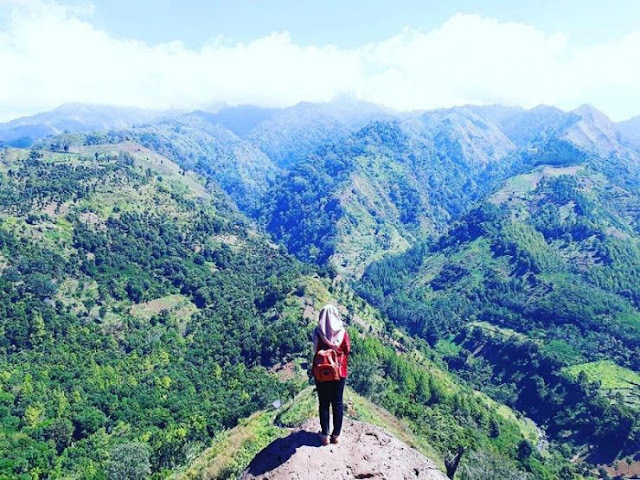 And like Puncak Pass, the Arak-Pan Landscape is on the edge of the highway so it's very easy to reach. You don't need to travel far to New Zealand to enjoy the charm of a vast green grass rug. That is Bukit Jabal Kirmit which is still in the climbing base camp area of ​​Ijen Crater. This hill is always covered in green rugs surrounded by an attractive stretch of thatch. Instead of a New Zealand-style sheep farm, here you can find horses and deer. The towering Mount Ijen panorama and the cool air are guaranteed to make you feel at home for a long time here. Trees here deserve to be called "paramilitary rainbow" because they managed to catch a rainbow in the sky and store the rainbow on the trunk. That is certainly not true. 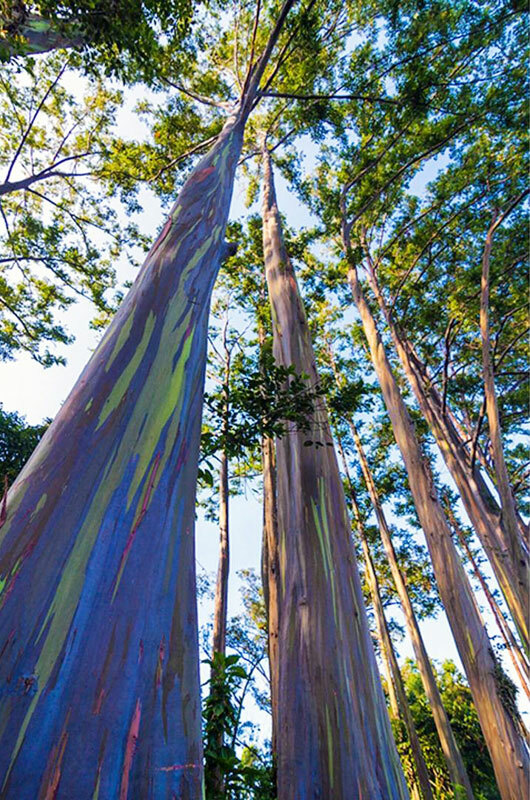 This tree with the scientific name Eucalyptus deglupta actually does have a multicolored stem like a rainbow. 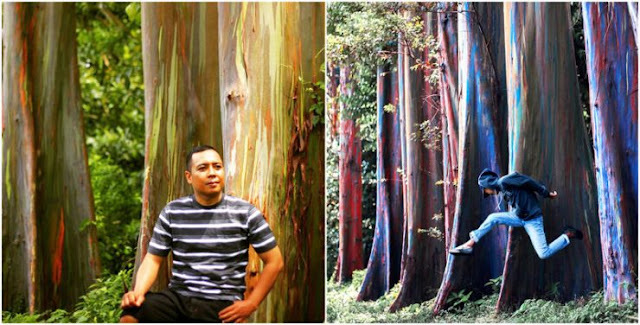 The colors on the trunk of the tree come from the sap that comes out of the tree and hits the bark and forms a layer of color. The color that emerges from the sap is blue, then changes to orange, purple and maroon. Unique huh? So to take pictures with the rainbow, there is no need to wait for rain. When you come to this place, these rainbow trees will swarm you to take a picture together. 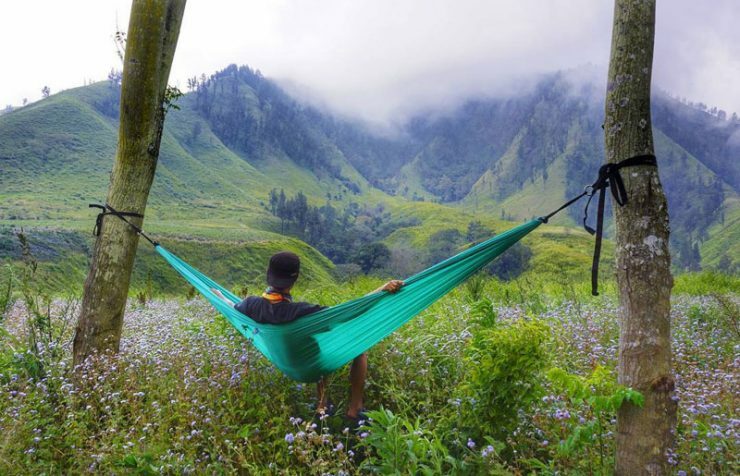 Patirana Peak which is on the slopes of Mount Argopuro is the most suitable place to enjoy the expanse of green pine forests. You will feel like seeing the beauty of the Alps in Switzerland! And just like in Europe there, your eyes are indeed spoiled by a series of neatly lined pine forests. The thin fog that hangs also adds to the beauty of this peak. Then what does the number 28 mean? 28 charm? 28 mandatory swivel points? It turns out that number 28 is the date of land clearing by the local village head, precisely August 28, 2016. If it is a matter of charm, the selfie point is of course more than 28! And one of the many charms is the sunset view. One word: WOW! Glingseran Village has indeed been blessed with stunning views of the slopes of Mount Argopuro. Now this village is getting more beautiful after being dressed up with various contemporary knick-knacks. The present gazebo building, suspension bridge decorated with various colors, also a variety of unique rocks deliberately prepared to add to the Instagram collection of visitors to this place. You can even play Flying Fox here! Also a time to stop at the waterfall. 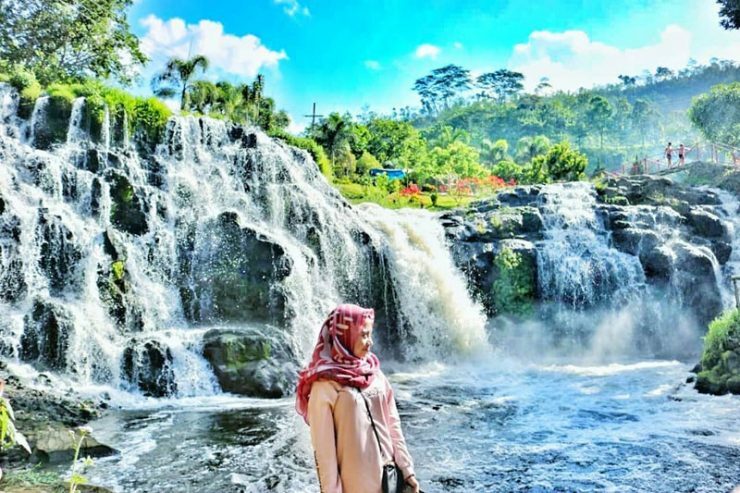 This 12 meter high waterfall named Tancak Sulaiman is full of unique selfie points and is second to none. 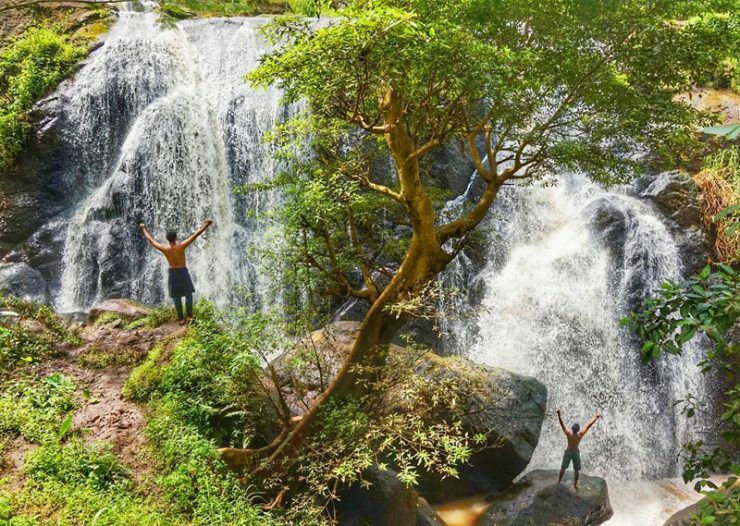 Do you want to get the title of a waterfall climber? Of course, I can. The trick, look for a sloping waterfall, not water that flows vertically like a waterfall in general. Example? Kalipait Waterfall! 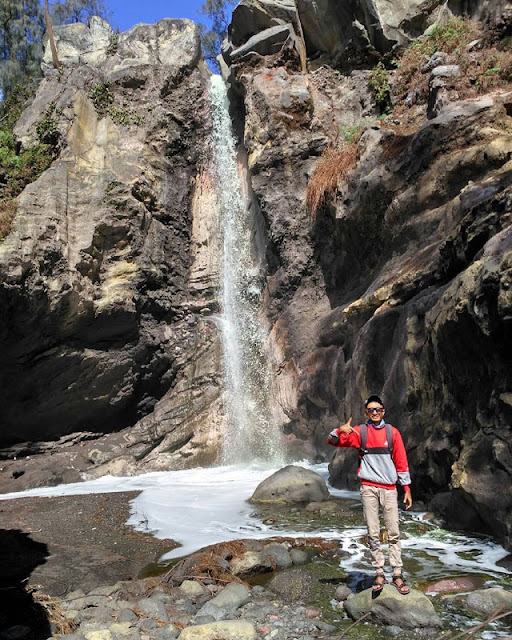 At the waterfall located at the foot of Mount Ijen you can easily climb the rocks on the edge to reach the top of the waterfall! The charm of nature from above this waterfall is truly extraordinary. 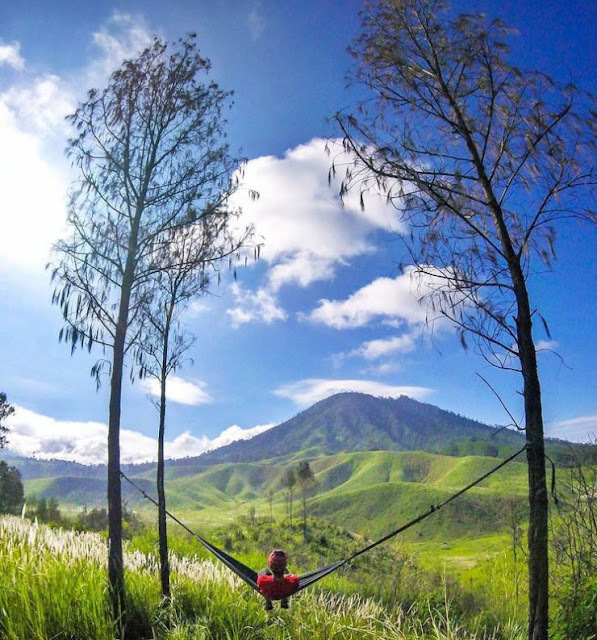 Covered by green forest with panoramic views of Mount Ijen and of course the air is refreshing. Your climb will not be wasted. Oh yeah, another unique feature of this waterfall is its yellowish green water. And from the name, you can guess that the water tastes bitter. This is because the water comes from Ijen Crater with high sulfur content. 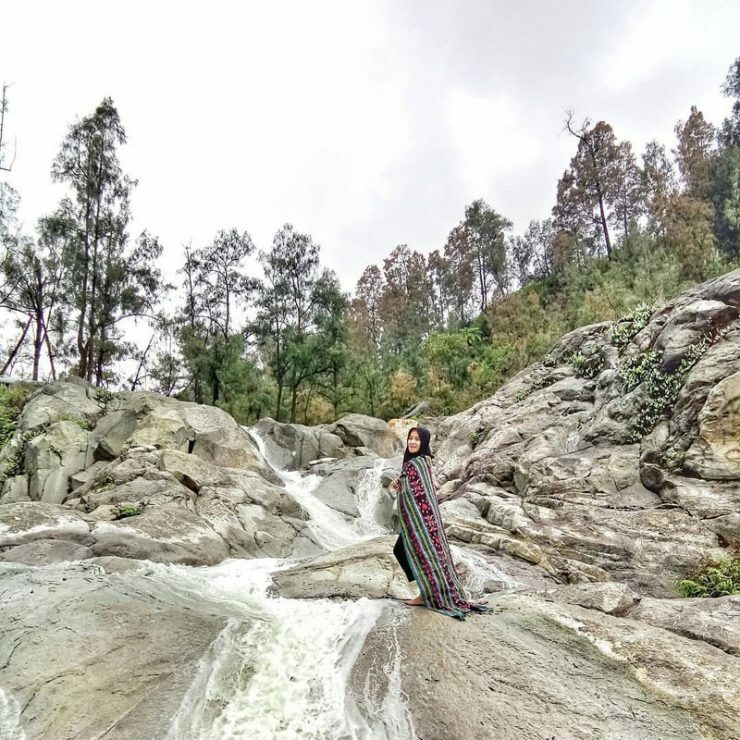 So, even though the waterfall can be climbed, the water should not be drunk. 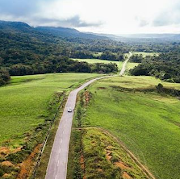 You are guaranteed to be mesmerized by the beautiful landscape from the top of the hill as far as the eye can see. How not, a row of pine forests extends like a sea, still added by Mount Argopuro and Raung Mountain which stand firm to accompany your vacation. Are you interested in coming? 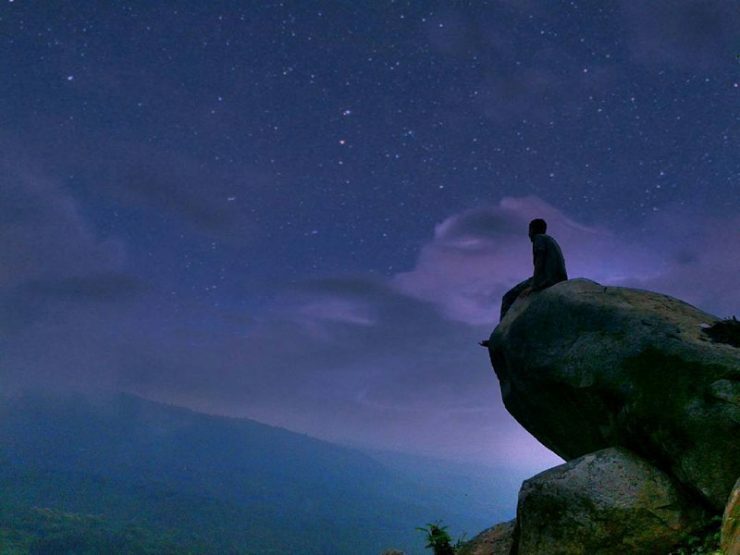 If there is one more good news, this place is only 30 minutes from the center of Bondowoso! Only at the city limits. Therefore, from its peak you can also enjoy views of Bondowoso city from above clearly, also city lights at night. 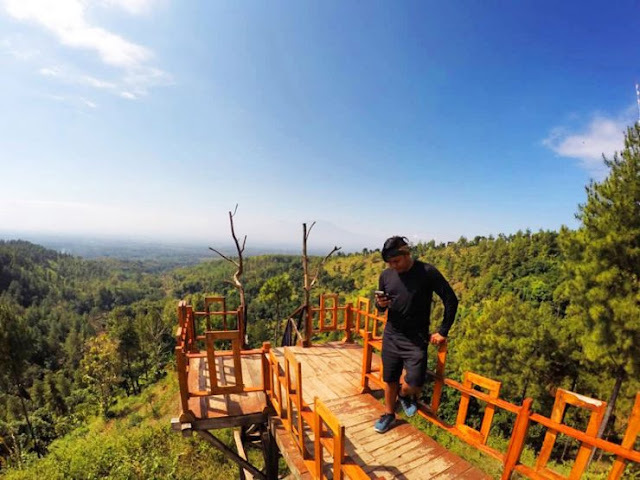 Taman Galuh is located at the foot of the green Crengih Mountain and cool air. From here you can also greet Ijen Crater that pops up from behind the clouds. Here you will find beautiful colorful flowers. 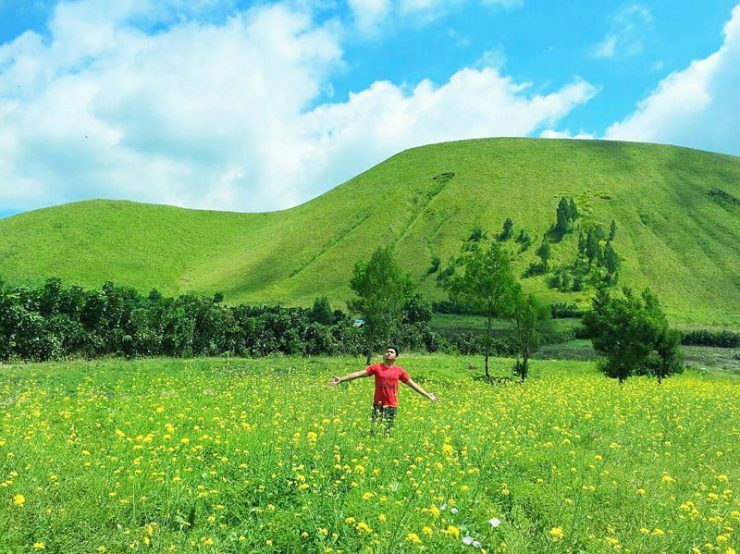 Interested in having a collection of photos with a rainbow of colorful flowers and towering green hills, right? And of course the most unique and cool thing is this flower garden is planted and cared for by nature! So don't disturb the flowers here! 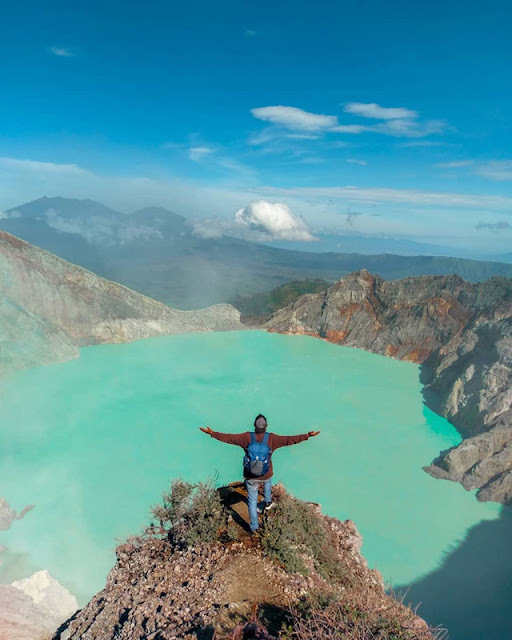 After all, Ijen's Crater isn't in Banyuwangi? Well, because the location of this crater is between Banyuwangi and Bondowoso, so there's nothing wrong if we list it here. 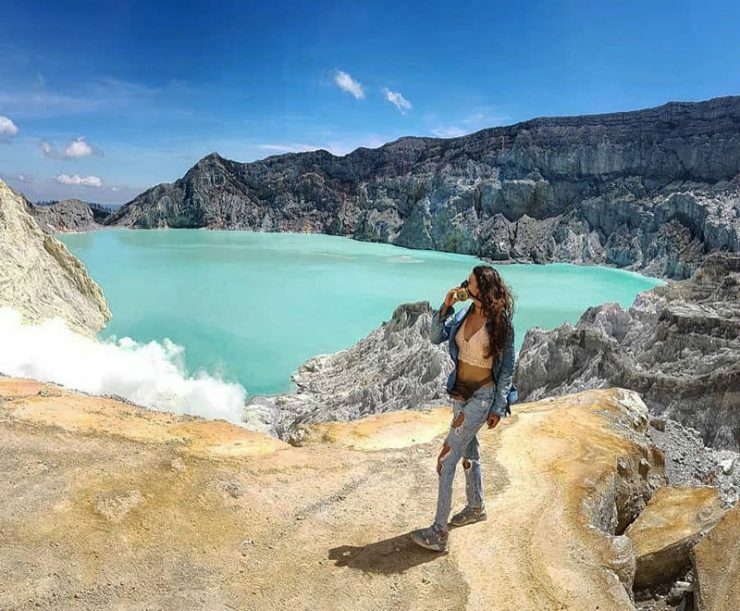 The beauty of the Ijen Crater is already famous throughout the world and certainly not without reason. For those who don't know, Ijen Crater is a lake with bluish green water that is always covered in fog. The lake also emits "blue flames" that come from chemical reactions of sulfur and air gases. The lake water in this crater is blue and has a high acid content and pungent odor. Because of that, don't forget to bring your nose cover. 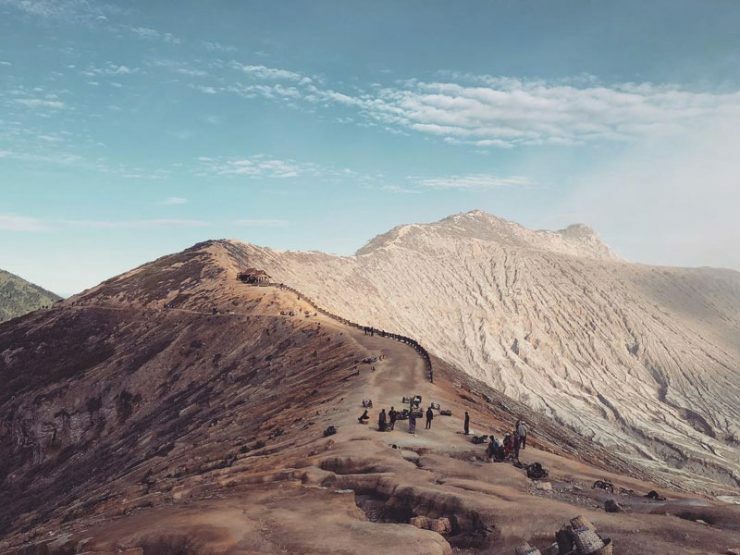 To go to Ijen Crater, you have to walk along the path along the Caldera cliff. You can surround this "alien" crater by walking for around 8 to 10 hours. There is a mountain here in the mountain, in the middle there is Bukit Ko'ong. 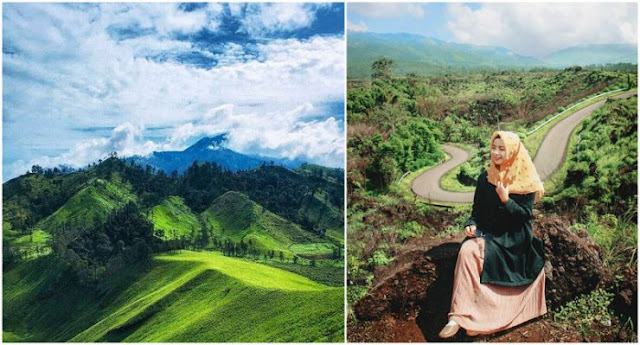 From here you can see the splendor of two famous mountains: Argopuro and Ijen, as well as forests, rice fields and residential areas between these two mountains. When hunting for the twilight charm, stay alert with your camera. You might be able to greet bats who have just started their day. Take it easy, as long as it's not disturbed, they are tame and want to pose for your camera anyway. Literally, Bukit Apetleppet does mean a multilayered hill. And the name of this hill is in accordance with reality. This hill covered in green tapestry is decorated with vertical overdrafts so that it looks like it is layered. In addition, behind it is a higher hill so that its shape also looks like a hill layer. The coolness and freshness of the air will undoubtedly make you feel more at home here. Did you know that Bondowoso turned out to be as cool as this? 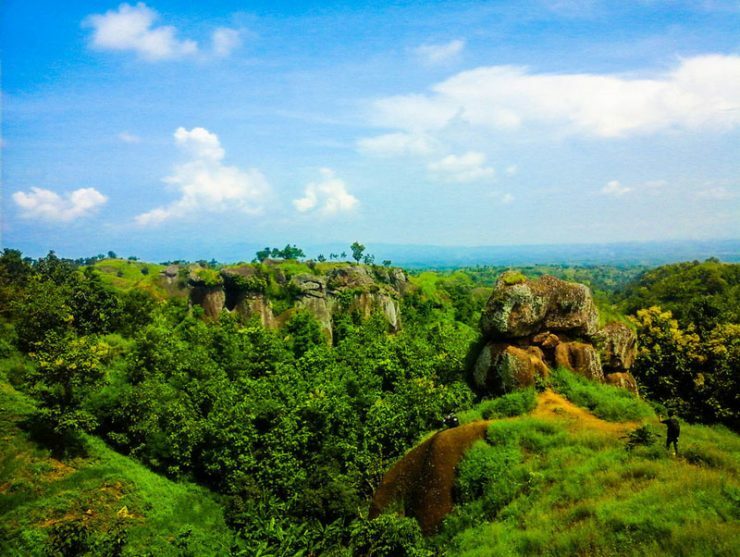 Which other cool places in Bondowoso do you think are worthy of being included in this list? Share with us in the comments column!